Torrential rainfall has a detrimental impact on the stability of soil-based agricultural embankments due to seepage and slope failure. The impact on the stability of an embankment due to rainfall patterns is specific to the geography, topography, and geometry of the embankment. However, this stability has not been widely assessed and updated with respect to new climate regimes. 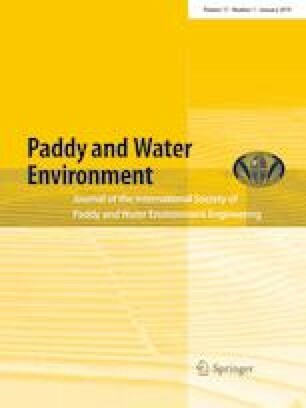 In this study, the slope stability of an agricultural embankment was evaluated based on five synthetic rainfall patterns derived from actual heavy rainfall events. The rainfall patterns were generated based on common patterns of rainfall hyetographs used in hydrological design and practice. The stability of the embankment was computed using the limit equilibrium method. Results of the stability analyses revealed time-series slope instability under rainfall patterns, and particularly the rainfall pattern that caused the most instability to the embankment was identified. Therefore, reassessment of the stability of the embankment in potential areas prone to heavy rainfall and flooding is beneficial to the preparation of early warning and emergency planning and preparedness as countermeasures for mitigating sediment-related hazards and disasters.